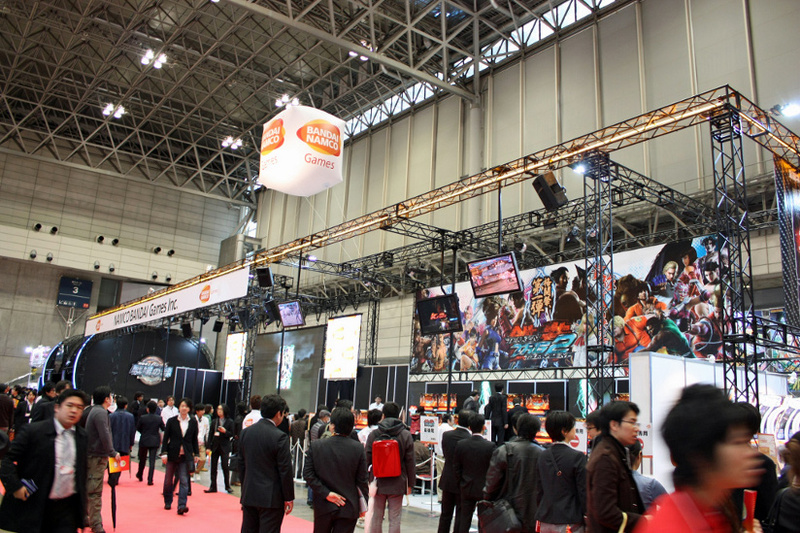 Here’s a new batch of images to come out of AOU 2011 that is now taking place in Japan. We’re not able to be there personally but there is quite a bit of coverage from the event from the many game news sites located in Japan. 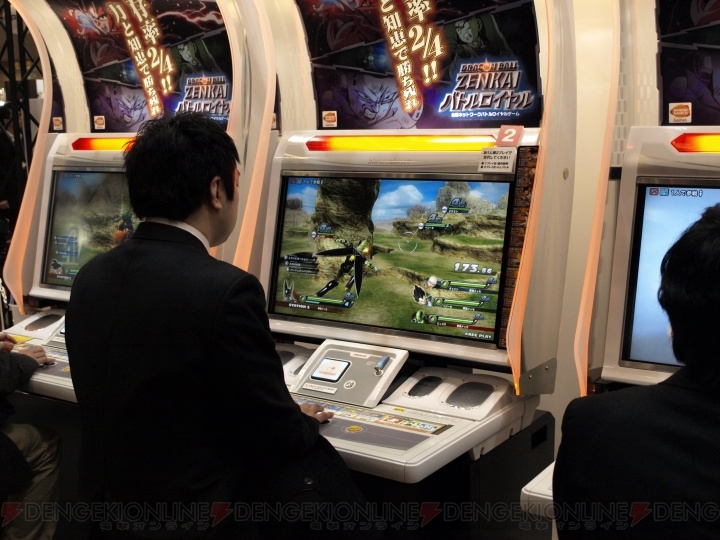 Hit the post break for the images to see some of the latest content Japanese arcade makers are working on, including shots of the new Let’s Go Island 3D, Tekken Tag Tournament 2, Chaos Code, a new version of Virtua Fighter 5 and more! 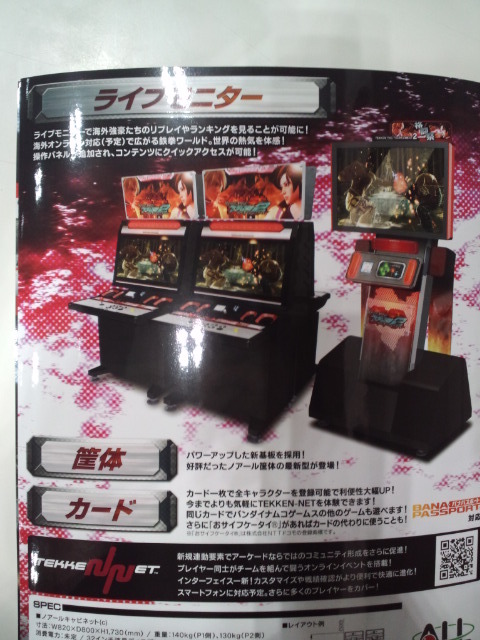 UPDATE: Added a little info on the Konami booth and some more pics of Namco products including the new Gundam pods they are releasing. Also added a new video of a walkaround the show so you can see many of these games in action. 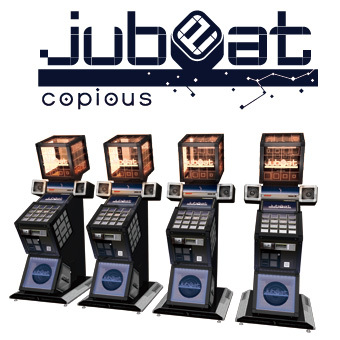 I’ve also added a video of Jubeat Copious too. UPDATE: (Thanks to Bacon for sending us the tip) – Here’s a walkaround AOU by akihabaranews. In this 10 minute video we get to see many games that we have talked about here but haven’t seen in action – Maximum Heat 3D, Super Mario Bros. Wii World Coins, Dragon Ball Zenkai, and others. UPDATE#2: Many more videos online now, take a look here. Please note that much more will be on it’s way over the next day or so. 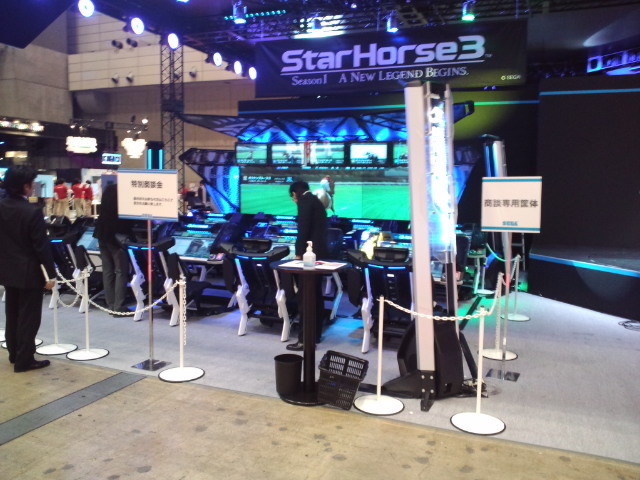 I haven’t seen booth pics yet of either Konami or Taito so stay tuned for those. 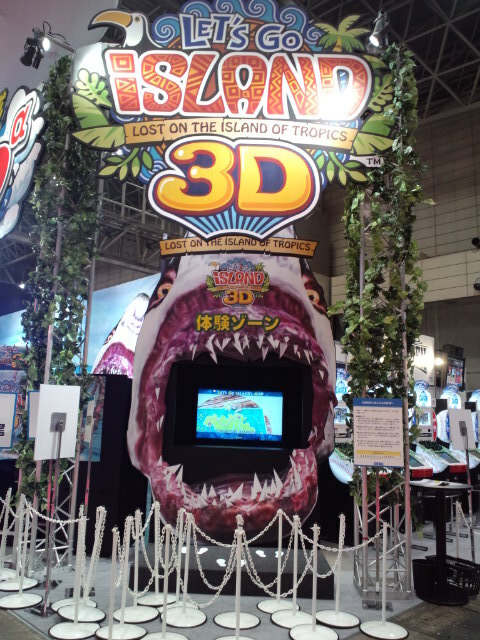 Sega’s Let’s Go Island 3D – We found out about this recently but here’s the booth Sega setup for the game, showing off their big-screen 3DTV technology, no glasses necessary. 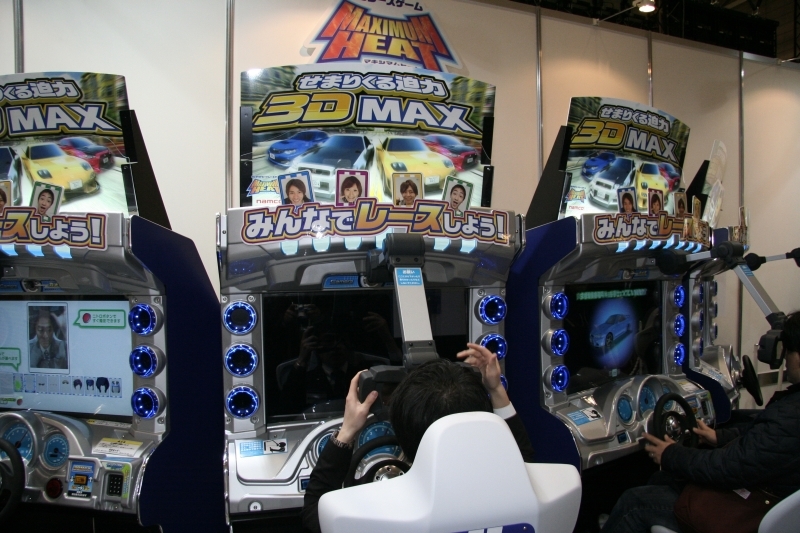 We’ve said before that this is really the only way for the 3D craze to take off in arcades and it looks like Sega has managed it. AM-Net is showing a cost of 2.1 million yen, which is roughly $25k USD . While a high price, it’s actually lower than some 3D games we’ve seen in Japan like RoadFighters which was going for something like $35k and that required glasses. This uses a full stereoscopic 3DTV that is 52″ in size. This will be released in Japan this July. 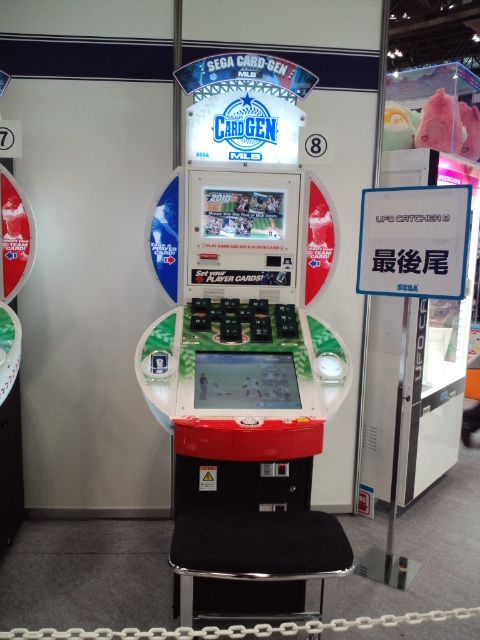 You can also see Sega MLB Card Gen 2010 to the right. Sega Card Gen MLB 2010. This is what happens when an interesting game doesn’t test well in the USA – it goes to Japan instead. It’s too bad really. You can read about the history on this game here. 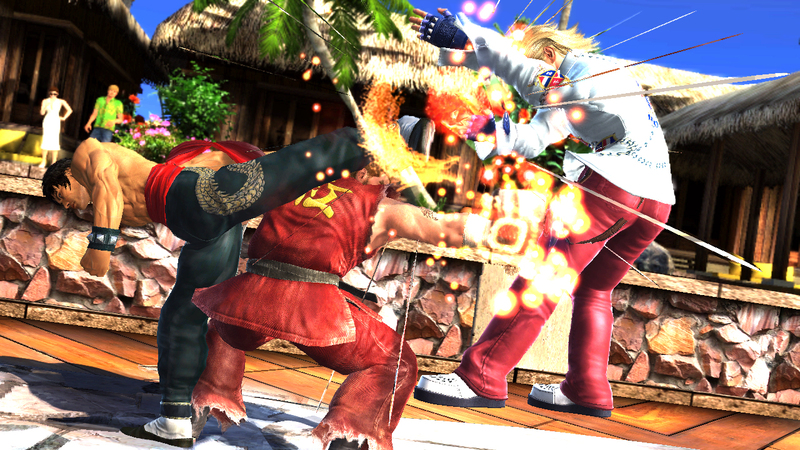 Tekken Tag Tournament 2 (official site). First is a new trailer, which shows off allt he new features the game has, from the new card system, to character customization, weapon use, arena deformations, team ranking then some flyer scans by AM-Net. I wonder when they will be showing Street Fighter X Tekken? Regarding that new card system being used on TTT2, here is an official site for that, it’s called Banapassport and it will be used on not just Tag 2 but also the new Dragonball Z arcade game and a new version of Gundam(pictured below, via Game Watch). 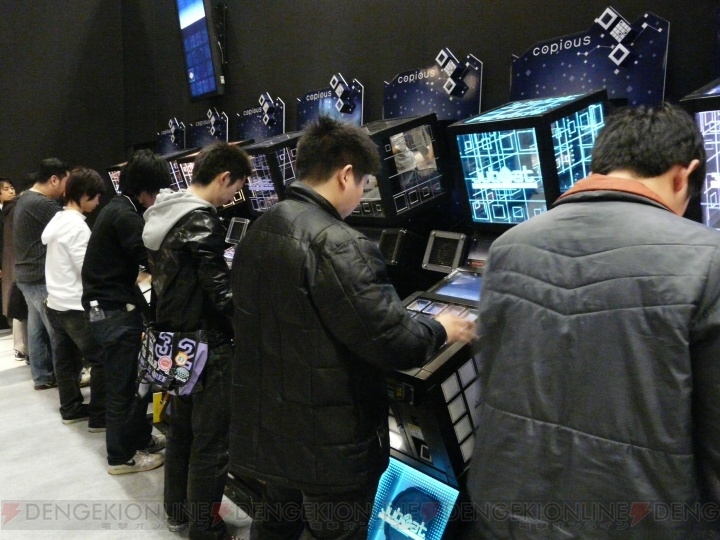 Here’s a pic of their Jubeat Copious game which will come out this summer. 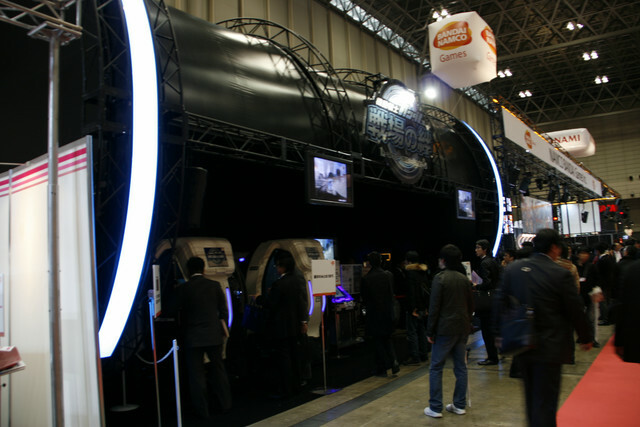 I haven’t come across any pics of Konami’s booth yet so that will probably come later. 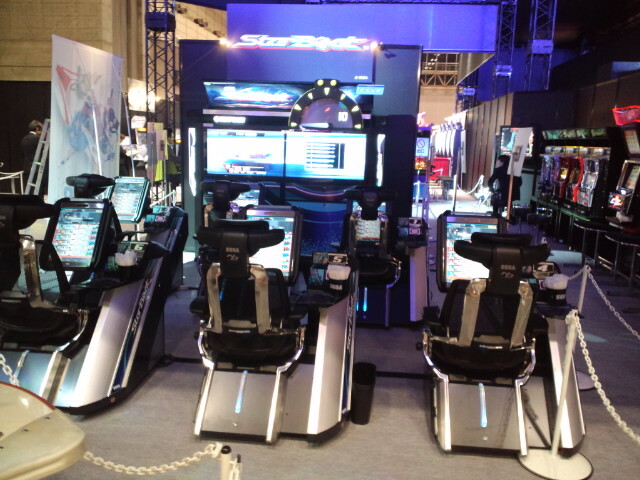 UPDATE: Dengeki Online has some pictures of the Konami booth including Hello PopN’Music and the new Jubeat Copious being played. They also have a railway simulator there which looks somewhat interesting. Speaking of capcom x namco Weren’t there suppose to be a virtua fighter v tekken in development as the 2 companies seemed interested at one point. I really think they should release tekken tag 2 everywhere unlike what happened with tekken 6 where they didn’t want to release it but they should release it and let it lap it up for operators and then the home version should come out. My guess is that VF X TKN fell thorugh and then Namco approached Capcom and Capcom was interested so they did that instead. Maybe we still will see VF X TKN, if the other games are successful. 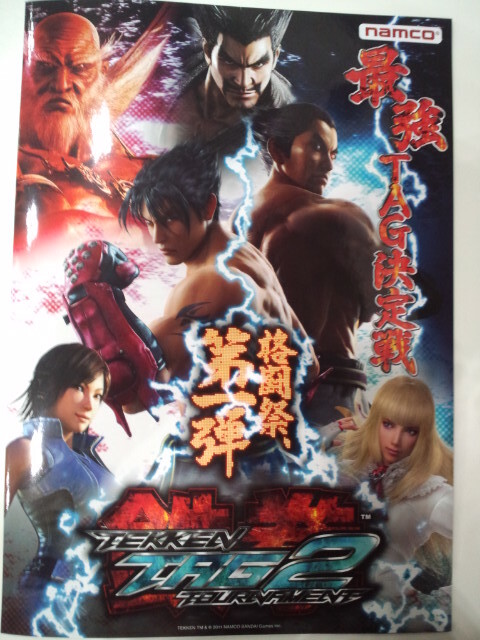 I agree that Namco should find a way to get TTT2 out everywhere. Learn from the mistakes made with T6 and go from there. They will need a 2p cabinet (I see that so far they are showing this in the one-person-per-cabinet config) and a good price – I think if they can get it in under $10k then it will be fine. Since they will most likely release TTT2 on consoles anyways, let that cover the dev costs instead of making the arcade version pay for it but then again, maybe there is more to it all than that. One thing I wonder about the new 3D tech Sega has developed is if they could make smaller screens for even better prices – 32″ and 42″ displays. Why not? 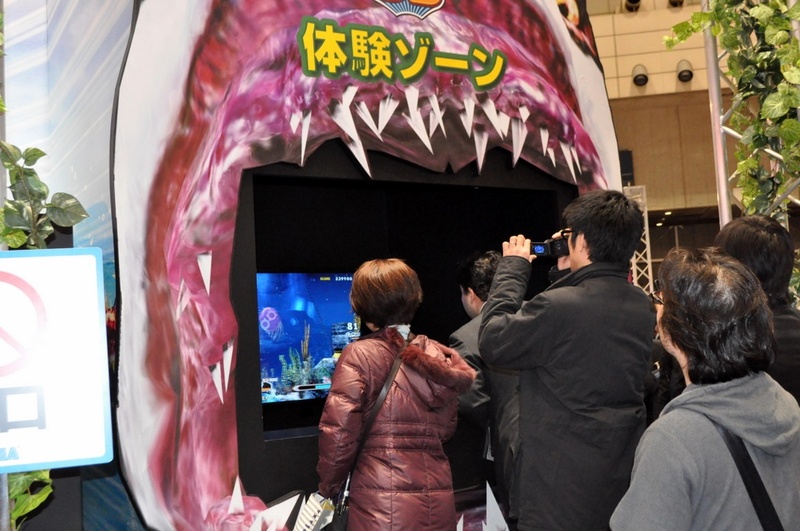 Now is the time to push non-glasses 3D I think and arcades will have a huge advantage for a while over home consoles in this regard since these kinds of displays just aren’t selling that well to consumers yet. In the case of Dead Heat, you would need more than the 3D glasses to mount to the cabinet, they would have to switch out the monitors as well I believe. I doubt we’ll see a kit but who knows. the one problem I have with Maximum Heat is that the glasses while rugged looking are also bulky. The Capcom vs Namco is still in the ‘works’ – it got moved to a back burner with the Sega vs. Namco announcement last year. Regarding glasses – the amusement trade dose not like having to have a supply of glasses loose so the main R&D is on glass-free (naked 3-D). Regarding a international presentation for the new Tekken – fat chance – the US has closed the door on this and the 3-D MH driver. Surprised no one has picked up on the new Namco name yet? I don’t see why they need to rush out the console version anyway, they should give it lots of time and if it gets delayed it’s ok and will have the arcade version to fall back on by selling more units. 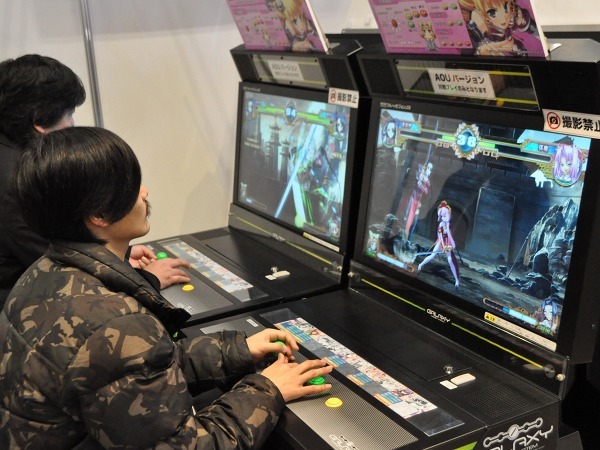 I wonder if tekken 7 will be the first in the series to use 3D with out the glasses of course? They’d miss a good opportunity if they didn’t especially as lots of people don’t have a 3D TV since most will have just got HD sets. Still no word on what hardware Koihime Dream is on? Chaos Code looks interesting, but looks like a doujin game. Nevermind, answered my own question. Looks to be running on new NEO STANDARD hardware. Looks relatively low-end so it hopefully will be cheap. Uses SSD. Trying to avoid piracy? Seems unnecessary otherwise… though I suppose getting rid of the spinning disk of death in a high-heat environment would be helpful. JAMMA + JVS which is nice. Ah nice find, I overlooked that. It’s nice that someone out there is developing some new hardware every now and then. 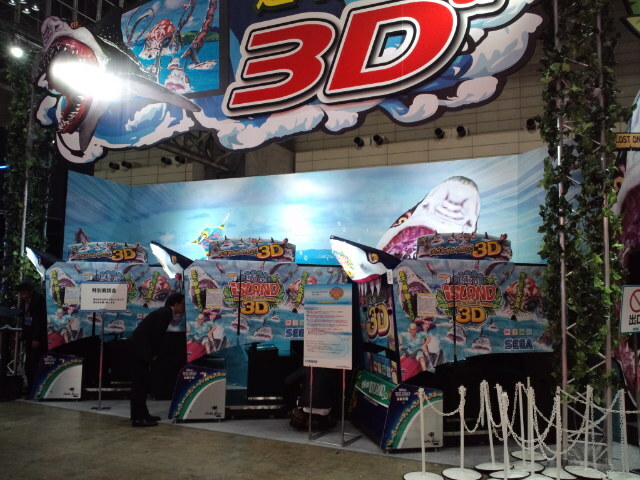 SSD is becoming more popular, Sega’s Ringedge uses it, Ringwide uses CF. The Tokyo Drift kits I have use USB Flash drives instead of HDDs too. Part of it is the failure rate of HDDs but also HDDs are usually very large for one small game – Big Buck Safari has an 80GB HDD in it but the game itself only takes up a total of 5GB so it’s kind of a waste. On a multi-game thing like NESiCA then I can understandusing a large HDD but for single games there’s not much point to it anymore.